October is a magical month when the leaves turn brilliant colors and start decorating the ground as the nights get cooler and darker. No wonder it is a time filled with hearty food, hot cider, and spooky stories told around a fire. Perhaps one reason why people embrace the autumn so readily is the connection to family the season inspires. Throughout the years many fall activities have led me to new discoveries about my ancestors and the ways I can connect with them, particularly at historic places. 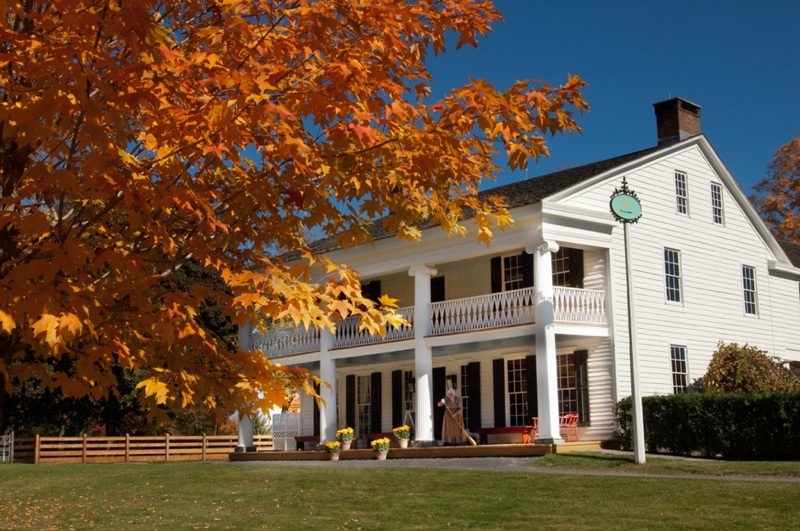 As Halloween approaches, I am reminded of the year my husband and I attended an event called “Things that Go Bump in the Night” at The Farmers’ Museum in Cooperstown, New York. Part of the Farmers’ Museum is a village that is home to historic buildings originally from various New York rural communities. The night we visited the museum was chilly and dark, perfect weather to indulge in ghost stories on our lantern-guided tour of the old village. Most of the tour I was anxious to get into one building in particular, as I had always been told that it was once owned by my family. The Bump Tavern was originally in Ashland, Greene County, and was at one time owned by my grandmother’s favorite aunt, Lucy D. Bump. Growing up, I heard many stories from my grandmother about Aunt Lucy, whom she loved dearly, but I never really questioned or understood how Lucy connected to our family. No one in my family currently has the Bump surname, so I always just assumed Lucy was a Holdridge who married one of the Bumps. A bit of digging through the records revealed a close connection through the years between the Holdridge and Bump families, plus a surprise I was not expecting. Lucy D. Bump inherited the Tavern when her husband, Franklin E. Bump, died in 1908; she owned it until her death in 1943. At that time the house was still in its original location in Ashland. Franklin had purchased the house in 1891 from his mother, Clarissa Bump, but it had at one time belonged to both his parents, Ephraim and Clarissa Bump. I started my search for more information on Lucy D. Bump in the 1892 New York State Census, where I found Frank and Lucy Bump living close to my ancestor, Joseph Holdridge, in Ashland. I descend from Joseph’s son, Frank Holdridge, who was 11 years old in 1892; Frank was my great-great-grandfather (the father of Leslie Holdridge). Since Frank Bump purchased the Bump Tavern in 1891, he was likely living there at the time this census was taken. This meant that my Holdridge family was not living far from where the tavern originally stood, and they were likely very familiar with the building. If my suspicions were correct, Lucy was one of Joseph and Mary Holdridge’s children. This would explain why my grandmother knew her as Aunt Lucy, since she would have been her great-aunt. Working further back in time, I made an interesting discovery. In 1875, Lucy was living in the household of Joseph and Mary Holdridge as a 9-year-old girl, as I had expected. However, her name was not Holdridge, it was Gifford. 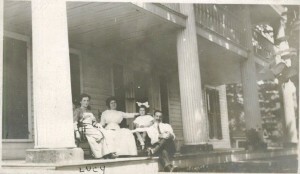 Lucy D. Gifford was recorded as Joseph Holdridge’s step-child along with her siblings, Herbert Gifford and Lulu Gifford. Family records in my mother’s genealogical files confirmed that Lucy was in fact Joseph Holdridge’s step-daughter. The first child born to Joseph and Mary Holdridge together was Charles Holdridge, who was born in 1872. This meant that Lucy Gifford would have been at least five years old or younger when Joseph Holdridge became her step-father. She was also the half-sister to my ancestor, Frank Holdridge. While she may not have been a Holdridge at the time of her birth, she certainly was raised as a part of the Holdridge family. My grandmother was born in 1930 and though she does not appear on the United States Federal Census for that year her parents, Leslie and Gladys (Tompkins) Holdridge, were living directly next to the widowed Lucy D. Bump, still in Ashland. Lucy remained close to Leslie and his family until her death. In all her stories about her favorite Aunt Lucy, the fact that Lucy was not born a Holdridge was never mentioned to me. Perhaps she did not feel it was important since Lucy was in fact her grandfather’s half-sister. Exploring family history often means taking unexpected turns. Uncovering Lucy Bump’s history only reinforced the connection I felt to the Bump Tavern, as I know that she embraced the Holdridge family as much as we embraced her. Family group on the steps of the Bump Tavern in Ashland; Aunt Lucy can be seen at left. On our tour of the Farmers’ Museum that crisp October night the tour guide told us of the ghostly happenings inside the Bump Tavern. As I was listening, I could not help but imagine my own ancestors walking the halls or sitting down for a meal or a visit. Regardless of the truth in the ghost stories, I could feel the energy of the place and was able to find a connection to the house and the Bumps as a part of my own family. Even on an eerie and dark tour the tavern felt peaceful, as if it was welcoming me home. Autumn is a time that most people reconnect with their families with the holidays right around the corner. In my experience, it is also an enchanted time to connect with the people of the past. Great story and great work – as a descendant of Edward Bompasse I can very much appreciate the connection – and the old voices that still echo about the place! Nicely done. Enjoyed reading this, great story!! I’ve had fun tracing the Rensselaerville area Giffords. I assume you probably are familiar with the line, which I think is: Lucy D.8 Jerome B7. Amial6 Henry5 Obadiah4 Simeon3 Robert2 William1. A closer reading and I realize that you aren’t descended from the Giffords. However, I believe I’m a Holdridge descendant, although I don’t have proof. I believe my ancestor was the sister of Felix and Thomas Holdridge, born in the early 1740s in Dutchess County. The Holdridge brothers followed my ancestors to Schaghticoke, NY and some later to Chautauqua County, NY, and there are other connections, but unfortunately “proof” will probably never be forthcoming.